I've stated for years how much I dislike Ubuntu's Unity interface. Yes, it's become more polished through the years, but it's just not an interface that thinks the same way I do. That's likely because I'm old and inflexible, but nevertheless, I've done everything I could to avoid using Unity, which usually means switching to Xubuntu. I actually really like Xubuntu, and the Xfce interface is close enough to the GNOME 2 look, that I hardly miss the way my laptop used to look before Unity. I wasn't alone in my disdain for Ubuntu's flagship desktop manager switch, and many folks either switched to Xubuntu or moved to another Debian/Ubuntu-based distro like Linux Mint. The MATE desktop started as a hack, in fact, because GNOME 3 and Unity were such drastic changes. I never really got into MATE, however, because I thought it was going to be nothing more than a hack and eventually would be unusable due to old GNOME 2 libraries phasing out and so forth. I'm very happy I was wrong, and with the advent of Ubuntu 16.04 LTS, I decided Ubuntu MATE (now officially in the Ubuntu family) was here to stay. It was the first version of 16.04 that I installed, and I've never looked back. 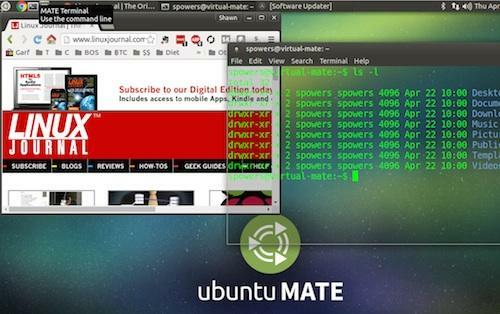 Running Ubuntu MATE is like living in an alternate reality where GNOME 3 and Unity were never invented. Imagine if GNOME 2 was still king, and you could tweak your desktop to look exactly like it always looked when using GNOME. It's glorious. Xubuntu, I still love you. You got me through a rough patch, and I'll forever be grateful. But I'm now an Ubuntu MATE man, and I have no plans of changing. And, if MATE 3.0 suddenly changes everything good about desktop computing again, I'll dust of my Xubuntu installer, and apologize for ever leaving!